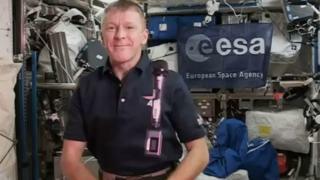 UK astronaut Tim Peake has tweeted a light-hearted apology after dialling a wrong number from space and saying to a woman on the other end of the line: "Hello, is this planet Earth?" Mr Peake said on Twitter it was not intended to be a "prank call". The astronaut, a father-of-two from Chichester, West Sussex, arrived at the International Space Station (ISS) on Tuesday 15 December. He is spending six months conducting scientific experiments on the station. He later tweeted a picture of a Stoke City FC flag in the space station. Lifelong Potters fan Andrew Rushton had persuaded Mr Peake to pack the emblem, which went up in a supply ship earlier in December. Mr Peake tweeted: "Happy Christmas @jollyhappybore - you did it!" Earlier in the week, Mr Peake helped two fellow crew members to conduct a space walk outside the ISS. Astronauts Tim Kopra and Scott Kelly, from the US space agency Nasa, went outside the ISS to fix a broken component. Mr Peake, who is a former major in the Army, is the first Briton to join the crew of the ISS and is employed by the European Space Agency. Helen Sharman became the first British citizen to travel to space when she visited the Soviet Mir orbiting station in 1991. Other Britons who have flown into space have done so either as private individuals or by taking US citizenship. Earlier this month Mr Peake, 43, was waved off by his wife and two sons, Thomas, six, and Oliver, four, at the Baikonur Cosmodrome in Kazakhstan.